Purchasing this item will earn you 351 reward points (Loyalty points $3.51) ! 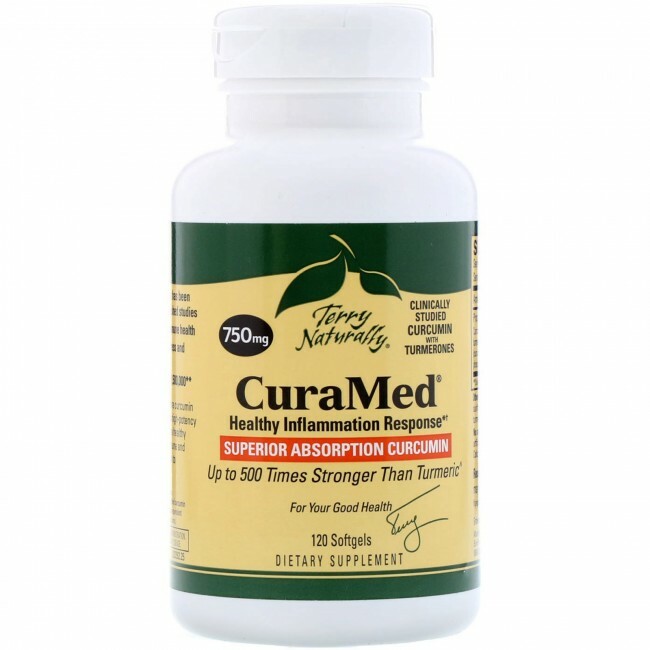 Curamed 750 mg 120 Softgels is the Superior Absorption turmeric. 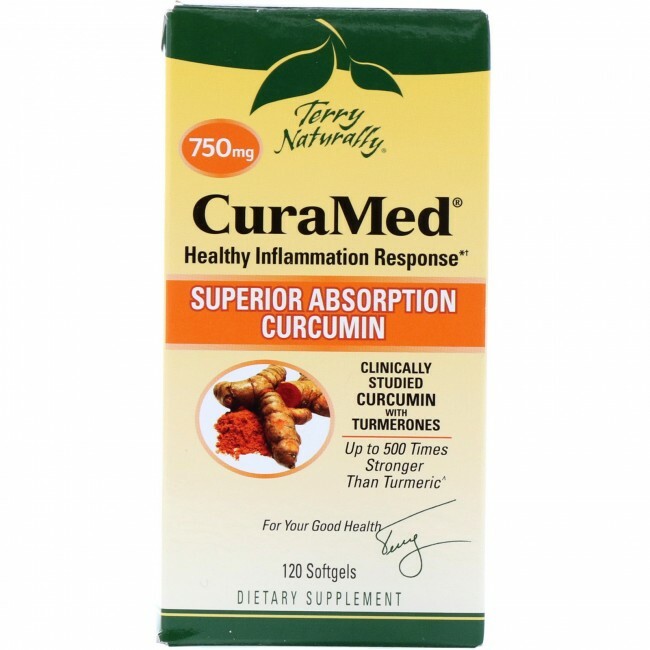 Terry Naturally Curamed is made with the only patented form of curcumin available. Do you experience occasional or frequent pain from headaches, muscle aches, backaches or joint stiffness or other inflammation response? 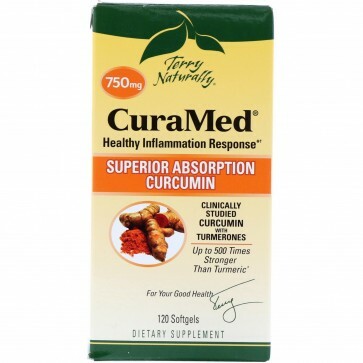 If so, you may benefit from taking Terry naturally curamed Superior Absorption Curcumin softgels. This product contains natural ingredients known to reduce inflammation and help aid the body’s natural response to pain. Unlike other painkillers that are commonly taken for pain, CuraMed does not cause unpleasant or dangerous side effects and is a safe, natural alternative to over-the-counter pain pills. Europhara CuraMed Superior Absorption Curcumin is made with the only patented form of curcumin available. No other turmeric product compares. It contains curcuminoids and turmerones, which both play essential roles in managing pain and inflammation. Curcuminoids are antioxidants and have been shown in studies to have anti-inflammatory effects. Turmerones aide in the absorption of curcumin and help to increase its activity after absorption. When combined, these two ingredients are highly effective at minimizing common aches and pains. 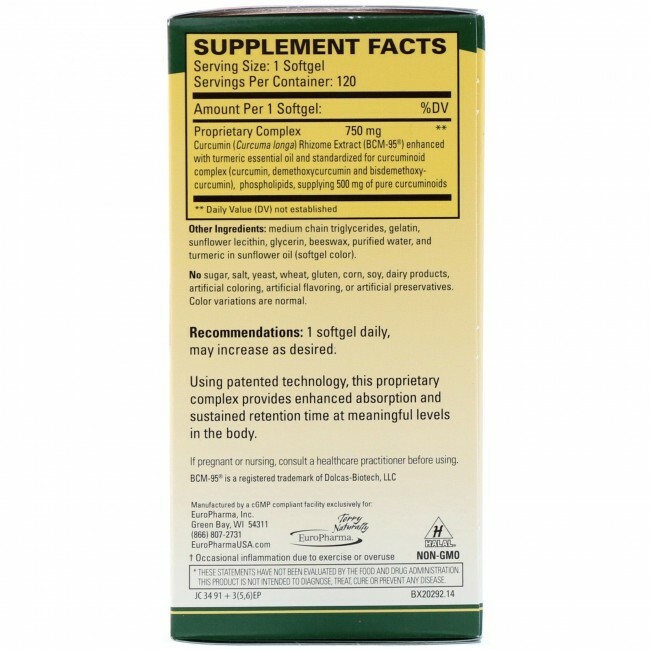 Terry Naturally CuraMed Superior Absorption 120 Softgels contains 120 doses (1 softgel per dose). Each softgel provides 500 mg of full spectrum curcuminoids extracted from non-GMO turmeric that is grown without chemicals. When compared to turmeric gram per gram, the form of clinically studied curcumin found in CuraMed delivers up to 500 times more curcumin into the bloodstream. This unique formula supplies 500 mg of pure curcuminoids, which have been shown to have anti-inflammatory properties. BCM-95® is standardized for curcuminoid complex, which includes curcumin, demethoxycurcumin, and bisdemethoxycurcumin. Curamed Superior Absorption provides safe and effective pain relief without dangerous side effects like those associated with NSAIDs (non-steroidal anti-inflammatory drugs including ibuprofen and aspirin). If you’re ready to experience relief from occasion pain and inflammation without exposing yourself to the many risks and side effects associated with over-the-counter NSAIDs, buy CuraMed Superior Absorption and give a try.